THIS IS A PREORDER. SHIPPING STARTS ON OR AROUND OCTOBER 12TH. BLOOD HARVEST RECORDS and HELTER SKELTER PRODUCTIONS are proud to present PUTRISECT’s highly anticipated debut mini-album, Cascading Inferno, on CD, Cassette and 12″ vinyl formats. PUTRISECT were formed in 2013 in Baltimore, Maryland by former members of Marrow, Plaguewielder, and Burning Axe. 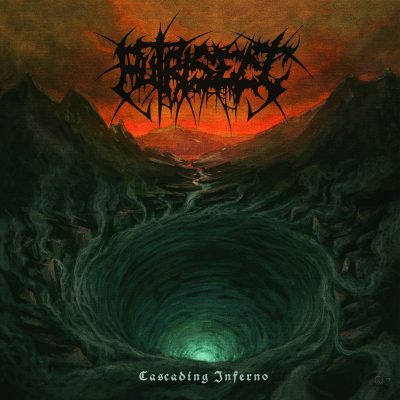 In 2014 they released the EP Chaos Awaits on Cricket Cemetery Records. In 2015, original vocalist Ren Megna was unable to to continue with the band, and Evan Harting was recruited as a replacement. In 2016, both a split with Scorched and a three-way split with Interment and Funebrarum were released by Unspeakable Axe/Dark Descent and Doomentia Records, respectively. PUTRISECT did a couple small runs on the East Coast of the US with Funebrarum and Scorched along with a European tour with Funebrarum and Interment following their performance at Netherlands Deathfest. With that experience under their belts, it comes as no surprise that PUTRISECT’s Cascading Inferno more than lives up to its ominous title. Cavernous yet clear, grim and grimy, PUTRISECT here create total DEATH METAL that authentically spans decades and locales, all whipped forth with a fury that bespeaks utter devotion to the mysteries of death and the beyond. Indeed, Cascading Inferno flows in waves, each one washing over the listener with dread and disease, and always with a linear trajectory, even when frequently dipping into downtempo doom. From deathrashing surge to roiling crunge, divebombing insanity to sepulchral crawl, PUTRISECT do it all, and they make it work wondrously across the mini-album’s compact 26-minute runtime. With mastering by Audiosiege, artwork by Misanthropic Art, and more touring lined up for later this year, Cascading Inferno hereby heralds the arrival of PUTRISECT!